Anna won a South African Premier Business Lifetime Achievement Award. The cabinets are stacked with trophies honouring her entrepreneurial spirit. The acclaim comes from both at home and abroad. 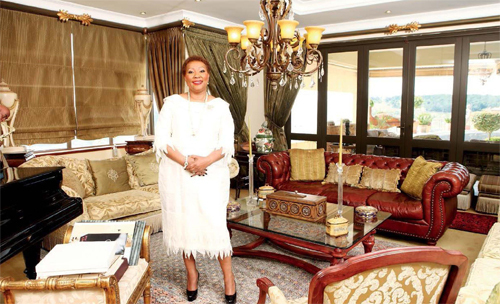 As co-founder and Group Executive Chairperson of one of South Africa's leading black empowerment companies, Community Investment Holdings (CIH), DrAnna Mokgokong chairs an empire that turns over R18 billion per annum. So you wouldn't expect this businesswoman to be fazed by yet another accolade. However, when we meet Anna, she tells us she was apprehensive about her latest prize - the South African Premier Business Lifetime Achievement Award from the Department of Trade and Industry. "The feeling after this award was dichotomous," she admits. "l was happy, but at the same time I had goosebumps. "After icons of business like Richard Maponya and Sam Motsuenyane, I'm humbled and feel greatly honoured. "I'm apprehensive as the expectations are high and yet I'm still Anna, nothing has changed. "But maybe my focus should change at this point, considering the plight of small and medium enterprises," she speculates. And that's something she takes seriously. She qualified as a doctor but succeeded in business. And she travels often so home is her favourite destination. Anna (58) started her South African career in medicine. Premier Business Born in Soweto and raised In Swaziland, Award. she completed a BSc degree at the University of Botswana. Then she qualified as a medical doctor at Medunsa in South Africa. Today, she sits on the boards of many companies locally and internationally, but she's not about to rest on her laurels. CIH, which has interests in healthcare, technology, logistics, mining and energy, has various new programmes on the go. "Expansion includes opening a coal mine in Waterberg, launching a gas company to generate energy, and significant property developments in the city of Tshwane, including the new iconic Tshwane house," she says. She may be at the top of her game, but she faces the same challenges as any other businessperson. "The most significant challenge is finding credible and well-meaning strategic partners, and raising capital that's patriotic and meaningful to black economic empowerment realms," Anna explains. "The one bringing capital wants the lion's share. Unless this is addressed, we will fail to transform our country economically." A lot more needs to be done to unlock opportunities for others in SA, says Anna. "We need willing cadres in the economic front to create opportunities for our people. We need role models to inspire our youth." She has little time for tenderpreneurs, and insists South Africa needs black industrialists who can create the huge industries that can further unlock opportunities for small businesses. "We need o onesfop shop for small businesses"
"We may have only a few billionaires, but there's certainly lots of thriving businesses out there. We need a one- stop shop for small businesses, so everything is accessible business plans, advice, a doctor but banking institutions, etc. We need patriotic capital to take care of their financial needs." Anna loves cooking and baking in her kitchen. She's passionate about empowering small and medium enterprises, and particulasrly women. Anna says Black Economic Empowerment (BEE) is far from completion. "BEE is a journey," she explains. "It has no expiry date. It will still be there for as long as black people are in the majority, and there's no equitable distribution of wealth and resources. "BEE is a means, an enablement. We have now gone through the first 2O years of our democracy, but a lot more needs to happen. We need to have more tenacious and resilient blacks to push this agenda and succeed." Anna is also a former president of the South African Women Entrepreneurs Network and the International Women's Forum of South Africa. "Women have traditionally been savers, hence we're used to hiding money in our bosoms. This practice must be channelled into encouraging women to get into more formalised, sustainable, proper savings like the tax-free savings the banks now have. We should form and open a women's bank, as women are the majority of the population." With her fingers in so many pies, Anna is a very busy woman. She spends most of her time on the road in business negotiations. Her favourite destination is London. "l can relate to it. There's so much to do there and no language barrier." When she does get time off, you'll likely find her at home. "l love cooking and baking in my kitchen. I also love interior decorating, moving things around the home, and entertaining guests. "We should form and open a women's bank"
Anna's hobbies include interior decoration, and she loves entertaining. "My favourite holiday destination is my home." She tells us she also enjoys reading Alexander McCall Smith's Botswana y books when she wants to 3 relax and have a laugh. There's got to be time for some fun too, and Anna admits she sometimes goes out "for a riotous Saturday lunch with friends". And one must always make time for family, of course. "My grandchildren from my nieces and nephews think I'm a cool gogo. They get terribly spoilt when they visit, and we boogie and dance together. They copy my dance moves," she chuckles. Anna is mom to two children, Neo and Dineo, and her wish for them is to stay humble. "Humility is sacred, and hard work pays," she says firmly. "I've brought them up for the world, not just South Africa. They must explore any option that can catapult them into the world. "l believe that the world is your oyster, but you should always remain a patriotic South African. As South Africans, we're world class and can survive anywhere."